British Prime Minister Theresa May formally asked the European Union to postpone the UK's departure until June 30. Prime Minister Theresa May said on Wednesday she deeply regretted her decision to seek a Brexit extension from the European Union and she urged lawmakers, who have twice previously rejected her plan, to back her now. "This delay is a matter of great personal regret for me," May said in a statement delivered in her Downing Street residence. "I passionately hope that (lawmakers) will find a way to back the deal I have negotiated with the EU, a deal that delivers on the referendum and is the very best deal negotiable, and I will continue to work night and day to secure the support" for the deal. "But I am not prepared to delay Brexit any further than the 30th of June," she said. TRT World Correspondent, Sarah Morice reports from London. British Prime Minister Theresa May formally asked the EU on Wednesday to postpone Britain's departure from the bloc — due in nine days — until June 30. But a frustrated EU said delay is possible if the UK lawmakers approve the deal first. In a letter to European Council President Donald Tusk, May said the Brexit process "clearly will not be completed before 29 March, 2019" — the date fixed in law two years ago for Britain's departure. TRT World's Sarah Morice has more. European Council president Donald Tusk said that EU leaders could approve a short delay to Brexit if British lawmakers finally approve the withdrawal deal they have twice rejected. "Even if the hope for a final success may seem frail, even illusory, and although Brexit fatigue is increasingly visible and justified, we cannot give up seeking until the very last moment a positive solution, of course without opening up the withdrawal agreement." Opposition politicians, and pro-EU members of May's Conservative government, had urged a longer extension, saying a delay of just a few months could leave Britain once again facing a cliff-edge "no-deal" Brexit this summer. Withdrawing without a deal could mean a huge disruption for businesses and people in the UK and the 27 remaining EU countries. But a long extension would infuriate the pro-Brexit wing of May's divided party, and would require Britain to participate in May 23-26 elections for the European Parliament. "As prime minister I am not prepared to delay Brexit any further than June 30," she said in the House of Commons. May said a longer delay would result in Parliament spending "endless hours contemplating its navel on Brexit." "Today marks 1,000 days since the referendum and this government has led the country and themselves into crisis, chaos and division," said opposition Labour Party leader Jeremy Corbyn. British lawmakers have twice rejected the Brexit deal May has struck with the bloc. Her troubles deepened when the speaker of the House of Commons ruled earlier this week that she can't ask Parliament to vote on the deal again unless it is substantially changed. That scuttled May's plan to try a third time this week to get the agreement approved. May told Tusk that despite the ruling, "it remains my intention to bring the deal back to the House." If it is approved, she plans to use the extension until June 30 in order for Parliament to pass the necessary legislation for Britain's departure. A delay to Britain's withdrawal requires the approval of all 27 remaining EU countries — and that's not guaranteed. 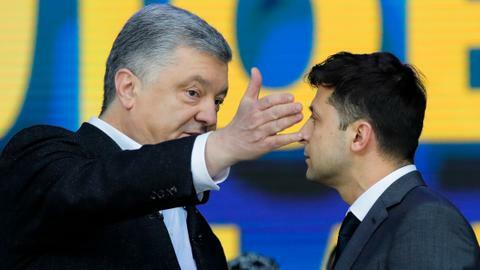 Any delay that required Britain to take part in European parliamentary elections would be a major headache for the bloc, and some EU leaders want a short extension to end by May 23, when voting begins. The head of the bloc's executive branch said EU leaders are unlikely to agree to a delay at a summit this week. European Commission President Jean-Claude Juncker said if May wanted a delay, "she must bring approval of the negotiated deal and she must bring clear ideas on timing." 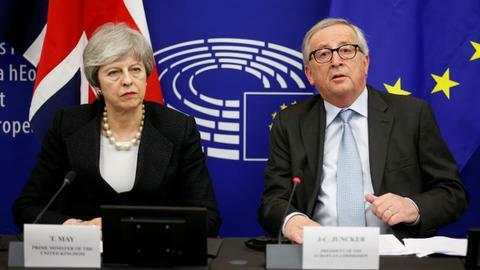 "My impression is ... that this week at the European Council there will be no decision, but that we will probably have to meet again next week, because Mrs. May doesn't have agreement to anything, either in her Cabinet or in Parliament," Juncker told Germany's Deutschlandfunk radio. "As long as we don't know what Britain could say yes to, we can't reach a decision." Britain's political chaos has drawn reactions ranging from sympathy to scorn at home and around the world. On its front page Wednesday, the Brexit-backing Daily Mail newspaper bemoaned the time since the referendum as "1,000 lost days." From Washington, Donald Trump Jr said May should have listened to his father, who urged her last year to sue the EU in order to secure better departure terms. The US president has criticised May for not taking his advice. The president's multimillionaire son blamed "elites" in London and Brussels for scuttling Brexit. Writing in the Daily Telegraph, Trump Jr said, "Democracy in the UK is all but dead." Juncker said that "in all probability" Britain won't leave on March 29, but he underlined the EU's insistence that it will not reopen the painstakingly negotiated withdrawal agreement that British lawmakers have snubbed. Juncker said Britain's Parliament needed to decide whether it would approve the deal that is on the table.